There’s no better feeling than gift giving! 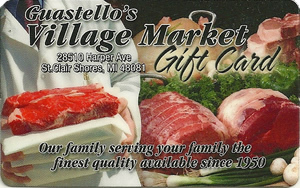 Guastello’s Village Market Gift Card provides a convenient and smart solution for any gift giving dilemma! Perfect for holidays, birthdays or any other special occasion. Why struggle to find that perfect gift when you can allow your recipient to choose from our fantastic line of foods, party trays, catering, or wine and liquor.